The partial government shutdown which lasted from December 22, 2018 to January 25, 2019 was the longest in American history, standing at 35 days. The shutdown began at midnight on December 22, 2018 due to a lapse in federal funding. A government shutdown occurs when either Congress fails to pass appropriation bills for the funding of government agencies, or when the sitting president refuses to sign appropriation bills into law, which creates a lapse of federal funding. The current budget and appropriations process for the United States government was enacted in 1976, and since then there have been 22 lapses in federal funding. Eight government shutdowns occurred under President Ronald Reagan, and the second-longest shutdown occurred under President Bill Clinton, lasting for 21 days. 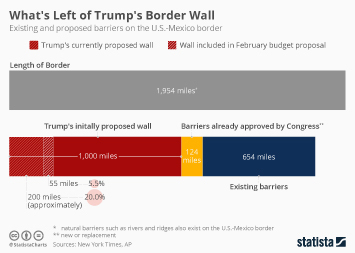 In the weeks leading up to the beginning of the shutdown, President Donald Trump demanded that the 115th Congress pass a federal appropriations bill that included 5.7 billion U.S. dollars designated to build a wall along the U.S.-Mexico border, thereby fulfilling his campaign promise to build a wall along the southern border in an effort to fight illegal immigration from Mexico and Central America into the United States. Congress refused to designate funds for a border wall, with two of the main detractors being incoming Speaker of the House Nancy Pelosi and Senate Minority Leader Chuck Schumer. Congress passed several funding bills that did not include border wall funding, which President Trump refused to sign into law. On December 22, 2018, Congress adjourned for the Christmas season, and the partial government shutdown began. Before the shutdown began, it was predicted that 420,000 federal employees would continue working throughout the shutdown without pay, 53,000 of which would be TSA agents at U.S. airports. In addition, 380,000 government employees would be furloughed during the shutdown. As of January 4, 2019, there were an estimated 102,183 employees working in agencies without appropriations in Washington, D.C., and eight percent of Americans said that the government shutdown has impacted their family a lot. The primary issue of the partial government shutdown was border security and funding for a wall or fencing along the U.S.-Mexico border. President Trump reportedly considered declaring a state of emergency, which would allow him to bypass congressional approval and delegate funds to build a wall. However, the majority of Americans disapproved of such steps being taken. 35 percent of Americans believe that illegal immigration is a very serious issue for the United States, but 43 percent oppose building additional fencing along the southern border. It has also been found that the majority of illegal arrivals in the U.S. occur by immigrants overstaying their visas rather than crossing a border without an inspection. The effects of the partial government shutdown were far-reaching. In addition to government employees working without pay or being furloughed, immigration court hearings were canceled, and the Congressional Budget Office predicts that the gross domestic product (GDP) of the U.S. will be impacted at least into the third quarter of 2019. 49.5 percent of Americans believed that President Trump deserves the most blame for the shutdown, a further 63 percent disapproved of the shutdown, and a majority also believed that Congress should compromise on issues instead of allowing the government to shut down.